On January 22, 2018, the CA DMV started to roll out the new REAL ID Driver License and ID Card. 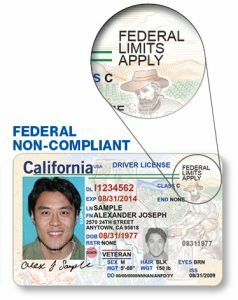 Now Californians have the option of requesting the federal compliant REAL ID Driver License or the federal non-compliant version. 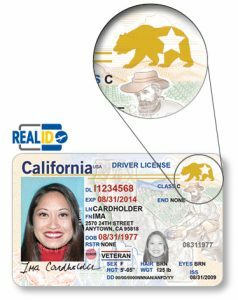 The new REAL ID Driver License features images of golden poppies (the state’s flower), sailboats, an outline of the state through the background, and a Gold Rush miner to the card’s right side. Most importantly, the licenses will have new UV images, and will contain a white REAL ID star inside a golden bear logo signifying a federally compliant license. The REAL ID is a federal-compliant identification document that will conform with the new federal requirements that will take effect October 1, 2020. Currently, Californians can board domestic flights and enter secure federal facilities and military bases with their CA driver licenses and ID cards. After October 1, 2020, only federal approved identification documents such as the new REAL ID Driver License and ID Card, U.S. Passport, passport card, or military identification will be accepted for those purposes. If you know you will not be boarding a domestic flight or visiting secure federal facilities or military bases, you do not need a REAL ID driver license or ID card. The DMV will continue to issue the non-federal compliant driver license and ID Cards, and those will include a “Federal Limits Apply” designation. If you are interested in applying for a REAL ID, you will need to prove your identity by submitting additional documentation. Once you have your documents in order you will go to the DMV (appointments are recommended) where the staff will verify all the documents presented. Your documents will be processed and returned to you. To assist in the process of organizing the required documentation, the DMV has a pre-appointment checklist available online. On my current driver’s license I have my maiden name and married name with no hyphen. When I applied for the real ID the first time I was told I needed a copy of my marriage certificate, since I was using that last name. I had all my documents went to the DMV again and was told I cannot use two last names on a Real ID. Even though, my social security card has two last names and my previous driver’s license (that the DMV kept) had two last names. When I questioned why I could have two last names on my social security card, I was told it was not compliant with the State of California. What? I was told since I was married and wanted to use my married last name, I had to choose to use my maiden name or married name, but not both. Ladies be aware that even though it’s not clear on the paperwork you need for a real ID, if you want to use your married name you have to have at least a copy of your marriage certificate, regardless of what last name is on your current ID.